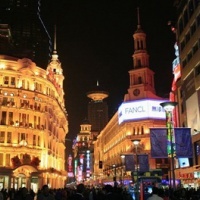 Nanjing Road (Nanjing Lu) is China's most important shopping street and popular Shanghai tourist attraction. 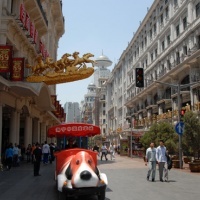 Located in the city center, it consists of East-Nanjing Road and West-Nanjing Road. 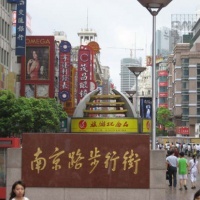 The former is in Huangpu District and extends from the Bund west to People's Square. 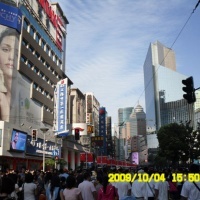 The latter begins at People's Square and continues westward towards Jing'an District. The history of Nanjing Lu can be dated back to 1851. At that time it was called "Park Lane". It's only a small lane 100 years ago, later the colonist grabbed a large area of lands with an excuse to build hippodrome, and build a casino with hippodrome in the outskirt and gardens in the center. The business stores only serviced the casino at that time. The colonist expanded the road in 1865 and named it Nanking Road. After that, the road was expanded from now and then from east to west, shops and stores were set up along the street one after another and brought prospect to commerce. 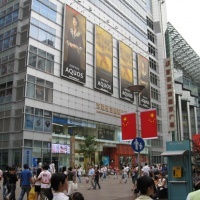 As the world's longest shopping pedestrian street (5.5km), Nanjing Road is famed for its luxurious shopping centers, where countless commodities from home and abroad are being sold, hence it is also named the "Shopping Paradise of the Oriental" and the "No. 1 commercial Street of China". It attracts more than 1.7 million visitors daily. Nearly all the visitors who trip to Shanghai would like to buy their favorite commodities in Nanjing Road because here the prices are reasonable and relative low. There are display windows here which will even stop you in your tracks! Just about everything can be found here. It's most popular buys are jewelry, electric gadgetries, cameras, watches, beading work, electric appliances, silk, knitted wears and well-known brands of clothes. Among these articles, jewelry and clothes are the first choices of the tourists. The goods for sale are set out attractively. So, if you plan a Shanghai tour, you'd better take your shopping budget into consideration in case of you cannot overcome their temptation. The night scene of Nanjing Road is charmingly and dizzily because the lights illuminate the buildings on both sides of the road. 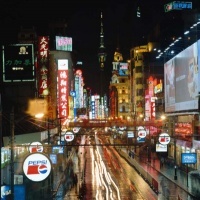 And a stroll down Nanjing Lu at night is neat, the window displays are eye catching as are the bits of neon. Tourists usually flock here to shopping or relaxing at night. Tourists and guests often celebrate various holidays at Nanjing Road, such as the Chinese New Year, New Year's Eve, Christmas and Easter. Some parts of the buildings and shopping malls seen in front of the Nanjing Road today may host a fireworks display over the main isle of the street.